Ever since it’s been building cars, Suzuki has dominated the perfect little all-wheel drive vehicle market. There’s the Sidekick, the Samurai, the forbidden Jimny and more recently the Xbee. Small cars were (are) Suzuki’s thing—but they turned out to not be most American consumers’ thing. But the 1987 Suzuki RT-1 concept is so perfectly batshit crazy, I feel like it could have been. Suzuki died in America, in part, because it never had its big Honda or Toyota moment of connecting with car buyers with inexpensive, practical and fuel efficient cars that weren’t, like, too weird or too dull. So, unable to challenge the big American automakers directly, Suzuki partnered up with General Motors, but that only made it worse. Now people could buy GM-branded Suzuki cars at GM dealers around the country, and Suzuki’s comparably small dealer network didn’t stand a chance. But in better times, having become bored (I assume) with taking a shrink ray to otherwise fairly standard crossover and SUV designs, Suzuki asked the question: What if we make a small mid-engine sports car that’s also an all-wheel drive SUV? Pulling details from this January 1988 issue of Car Styling Magazine that’s all about advanced Tokyo Motor Show concept cars which I’ve had on my desk for approximately three months, the RT-1 is lucky to have ever even existed outside of the company engineers’ dreams. Its body styling was very clearly a, uh, rough start for a lot of the design that would end up on the Autozam AZ-1 a few years later, after Mazda took over the project which still used Suzuki engines. But the RT-1 was four-wheel drive, and used engineering based on Suzuki’s flexible “full-floater” motorcycle suspension setup in the rear. Out back was a 1.6-liter 16-valve engine in midship configuration, geared up with what appears to be a stick for a six-speed manual transmission. An interior sketch details hose-like adjustable air-flow tubes in place of traditional vents, which didn’t make it to the physical concept, and detachable driver display gauges that appear to be for pitch and roll angle. 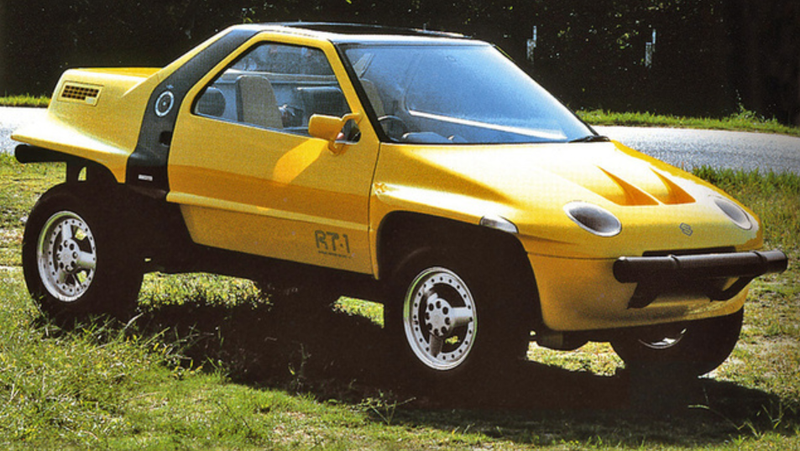 The RT-1 was shown off alongside two other Suzuki concepts at the 1987 Tokyo Motor Show, the RS-3 sports car which was also mid-engined, and the Elia, a funky, plasticky little Kei coupe. All of the concepts were abandoned, but a pretty clear path can be drawn from the RT-1 and RS-3 to the production of the AZ-1, which it looks a lot like. So at least we got something cool out of them eventually.